Not that kind of polling! 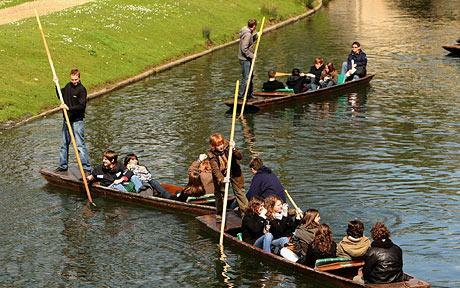 If you asked these people in Cambridge, “are you polling?”, they would answer by saying, “no you daft twit, we are punting!” Leave it to the English to use the wrong word for what is obviously polling. Speaking of polling, I came across a very encouraging poll from Gallup regarding the reasons Americans consider buying American important. Not surprisingly, neck and neck with supporting our country, was the reason that the poll respondents believed that buying American provided jobs for members of their extended American family. Equally interesting was the fact that 2/3 of poll respondents also stated they would be willing to pay more for American made goods. While you don’t have to pay more for lots of American made goods like Wigwam socks or King Louie jackets, it was nice to see that Americans were willing to spend a bit more to buy products if they knew that it would lead to new jobs for their American brothers and sisters. I urge you to check out the poll if you have a minute. This entry was posted in american made, Made in America, made in usa and tagged Gallup, King Louie, Made in America, Made in the USA, Opinion poll, United States, Wigwam. Bookmark the permalink. 1 Response to Not that kind of polling! The poll was very interesting! So glad that 45% of those polled are looking for made in America products. Hopefully, the movement will get bigger! You are doing a wonderful thing by bringing more American-made products to consumers’ attention. Our store, Norton’s U.S.A. sells only American-made goods. Deborah Leydig, our proprietor, was inspired to begin Norton’s U.S.A. after seeing so many jobs leave America. Our store has come from her passion to keep America working. I wanted to introduce you to our store as we share a joint mission. Please do not hesitate to contact us if you would like to know more.